I have a secret for you – models are human too! Even the prettiest model can have imperfect skin. But, that’s what Photoshop is for. 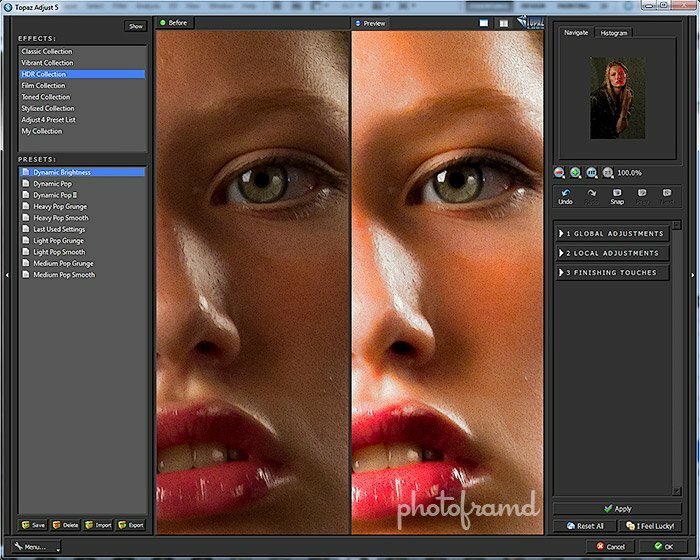 And, if you use the Topaz Labs plugins, it’s really quick and easy to retouch any portrait! 1. Topaz Clean minimizes small details. I have had the Topaz Labs Bundle for years, but I never knew what to do with Topaz Clean. After some experimentation, now I know. Topaz Clean will minimize details in a photo based on parameters like size. Think of it like filtering sand and pebbles. The sand falls through but the pebbles remain. It even comes with a Preset called “SkinEven”. But, since I live in the real world, I know skin has pores. If skin is too smooth, it looks fake. The goal is to minimize pore details but leave some texture. That detail will also make the photo look really sharp. 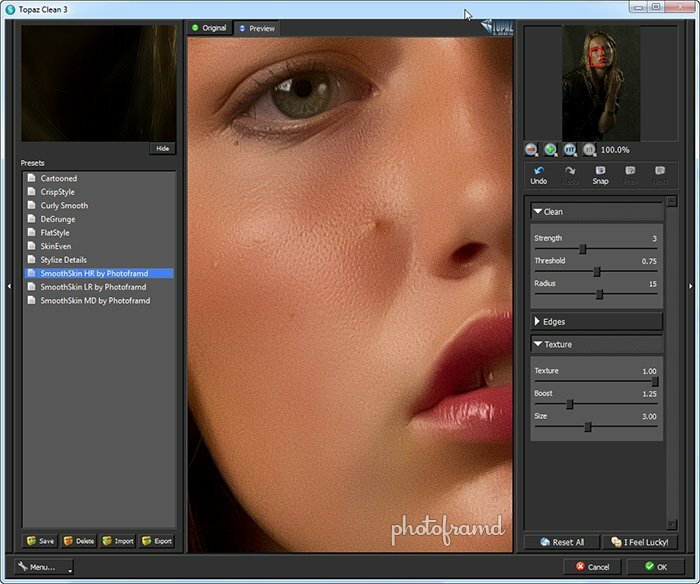 To make it easy, you can download my SmoothSkin by Photoframd presets for Topaz Clean 3. This Zip file actually contains three different Presets depending on the resolution of your photo (ex. Hi-res photos should use the HR version, web low-res photos should use LR and something in-between can use the MD version). Each of these presets can be tweaked further as needed just by adjusting the sliders. 2. Apply SmoothSkin to a duplicate layer and add a mask. 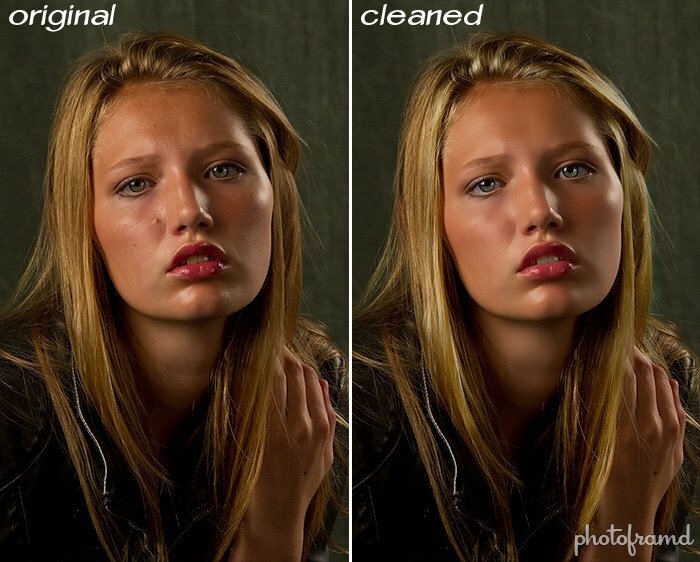 Topaz Clean does a great job on skin, but you do not want to lose any detail in the eyes or hair. So, I applied the SmoothSkin HR by Photoframd preset to a duplicate layer of the original image and added a mask layer to it. Working in the mask layer, I filled the mask with pure black and used a feathered brush with pure white to start brushing in the smooth skin. Remember, I am aiming for realistic beauty. Don’t worry about any remaining flaws. I will get back to that zit. 3. Make the eyes POP with Topaz Adjust 5. The trend is to exaggerate the detail in eyes. There are some very complex tutorials on the web on how-to create this effect. but, I find Topaz Adjust 5 does a great job and is a very quick one-step enhancement! Note – I used a duplicate of the original layer, not the layer from the previous step! (If you find the detail enhancement too extreme, you can always use a duplicate of the Cleaned layer from step 3.) You will need to play with the presets to see which one works best with the eye color, but Dynamic Brightness in the HDR Collection gives a POP without looking turning them into an extra for Twilight. Don’t worry about the rest of the face. This layer is only for the eyes. 4. Add a mask to the eye layer. Just like the previous layer, I added a mask to the eye layer and filled the mask with pure black. I then brushed in with pure white to reveal only the iris. This eye layer can also be used to bring out some details in the model’s hair. Try framing the model’s face with a little extra detail in the hair by brushing it in just like the iris. 5. Use the Healing Brush to fix any imperfections. Now for that zit! I used the Healing brush sized just big enough to cover the zit with one click. The Healing Brush was set for Content-Aware and Sample All Layers. I just clicked at the flaws to fix them. Note – I used a new layer to apply the Healing Brush so that I can always lessen the effect or rework the effect later. 6. Remove Yellow cast from eyes and teeth. One last step – you may also want to whiten the eyes or the teeth depending on the model and lighting. Try using the Sponge Tool in Photoshop set for Desaturate. All you need is to remove any yellow cast. The existing shadows will keep the photo looking realistic. If you think it is still a little too dark, try using the Dodge Tool for Midtones. But, use it sparingly to keep it natural. Less than 5-minutes to complete. I told you it was quick and easy to retouch a portrait with Topaz Labs! 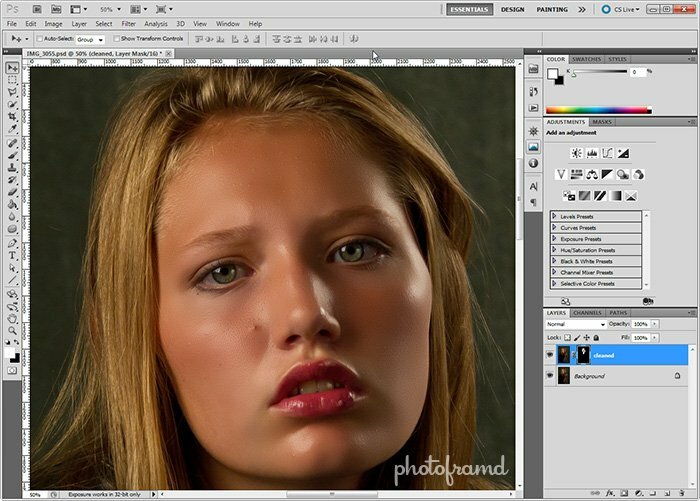 Best yet, to final image is very realistic and not over-processed — just realistic beauty! Please , quit with all the topaz plugin promotions. One more and I drop this feed. I write about things that are of interest to me and things that I want to share. I write about Topaz Labs because I am a REAL user of their products and I love their plugins. I use them every day! My blog has always been about photography/video and image manipulation. Simply put – Topaz Labs has the best line of Photoshop plugins. They are a small company that continues to innovate and simplify many complex tasks. Best yet – they do not charge crazy prices for their plugins like OnOne, NIK, Alien Skin and the rest. That’s why they have a strong user base and a loyal following … including me! I agree – the Topaz plugins are great and reasonably priced!